The manufacturer of high-performance analog integrated circuits appears to be a buyout target. What: Shares of Linear Technology (NASDAQ:LLTC) surged on Tuesday following a report by Bloomberg claiming that Analog Devices (NASDAQ:ADI) was in advanced talks to buy the company. Linear stock was up about 29% at 3:15 p.m. EDT, while Analog Devices stock had risen 4%. So what: Linear Technology manufactures high-performance analog integrated circuits used in mobile devices, networking products, PCs, automobiles, and other products. The company had a market capitalization of roughly $12 billion prior to Tuesday's gains, while Analog Devices was valued at around $19 billion. Both companies have been exceptionally and consistently profitable over the past decade. 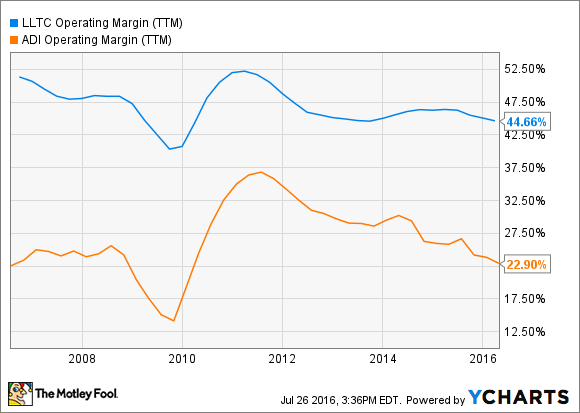 LLTC Operating Margin (TTM) data by YCharts. Bloomberg provided no details regarding the potential sale, with its sources saying only that no final agreement had been reached. If the deal does go through, it would create a company with nearly $5 billion of annual revenue and around $1.2 billion of net income, excluding any synergies or merger-related costs. Linear is expected to report its quarterly results after the market close on Tuesday. Now what: The spike in Linear shares due to this merger rumor has pushed the stock up to its highest level since the peak of the dot-com boom. At this point, there's no guarantee that the deal will go through, and investors will need to wait before more information becomes available.